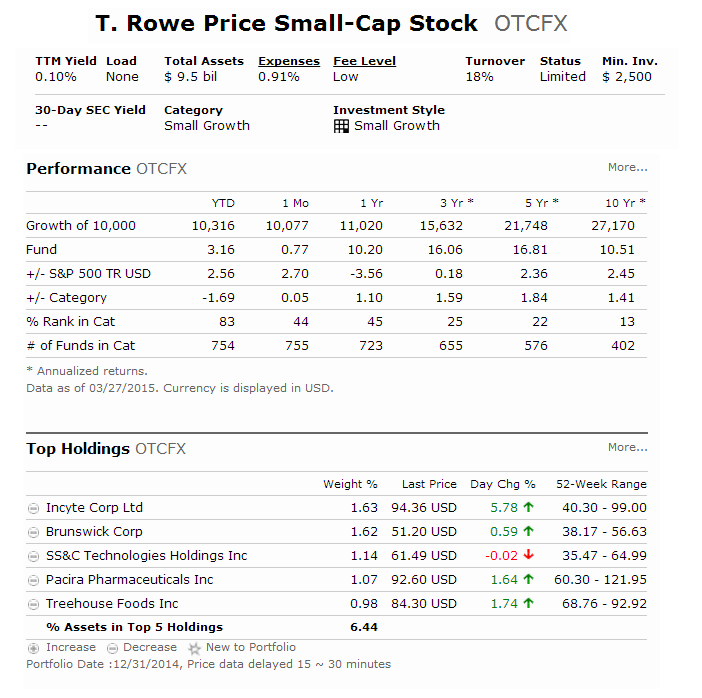 T Rowe Price Small Cap Stock Fund (OTCFX) is one of popular mutual funds. This equity fund invests mainly in stocks of small U.S. companies. A small company is defined as having a market capitalization that similar to the companies in the Russell 2000 Index or S&P Small-Cap 600. The fund objective is to provide long term capital appreciation. The current yield is only 0.10%. This small growth mutual fund is managed by Gregory A. McCrickard since 1992. It has $9.5 billion of assets. The expense ratio is 0.91%. There is no sales load. The portfolio turnover rate is quite low, only 18%. The current NAV price is $45.72. In 2014, this TRP fund has a year-to-date return of 6.90%. Morningstar has ranked this top mutual fund with 4 star & silver rating. It has returned 16.06% over the past 3 year, 16.81% over the past 5 year, and 10.51% over the past 10 year. This T. Rowe Price fund is closed to new retail investors since 2013. For retirement account, please check with your brokerage. The typically IRA may need $1,000 initial funding to invest. Top 5 stocks in its holdings are Incyte Corp Ltd, Brunswick Corp, SS&C Technologies Holdings Inc, Pacira Pharmaceuticals Inc, and Treehouse Foods Inc. Top 3 sectors are industrials, technology, and financial services. Investing in small cap has higher risks than typical equity stock fund. The investment risks are including market risk, management style risk, small company risk, growth stock risk, liquidity risk, etc. T Rowe Price Small Cap Stock Fund has performed consistently for the past years. There is very little yield for income seeker.